Yesterday we mentioned that the Tour of Flanders route for tomorrow has been substantially changed, leading to much controversy. The finish was changed from Meerbeke to Oudenaarde; famous hills like the Muur van Geraardsbergen and the Bosberg that have been the final two hills in almost every edition since 1975 have been removed from the course. The new final features the Oude Kwaremont and Paterberg, both will be climbed three times. Also included in the final are the infamous Koppenberg (climbed after the first passage of the Oude Kwaremont and Paterberg), the Steenbeekdries and the Kluisberg. Michele Bartoli, 1996 winner: "It’s worse than taking the Poggio from Milan-San Remo. 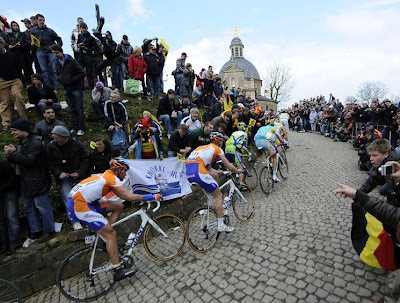 For me, the Muur is a piece of the history of the Tour of Flanders, it’s a huge loss. I mean, if I had attacked at another place [in 1996], it wouldn’t be remembered so readily now. 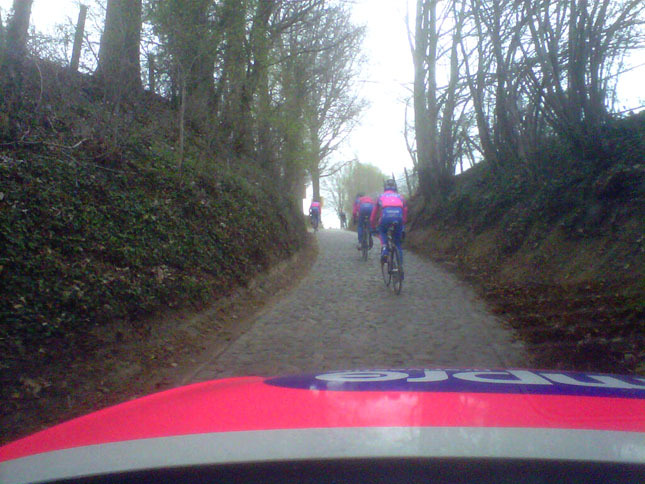 The Oude Kwaremont isn’t very hard, but it’s long and disjointed. It’s also a bit anomalous in that there’s a stretch of flat pavé afterwards that can hurt. The Paterberg is short but it goes up at 20%, a real wall. I couldn’t say if Flanders will be harder because it depends on the riders, but at its key points, the roads are very narrow, and technical ability will be fundamental." 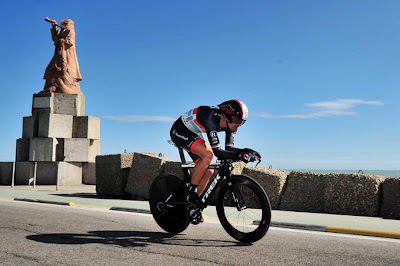 Fabian Cancellara, 2010 winner: "People are scared. There’s a lot of ‘why?’ also. Why have they changed the history of this race? I guess cycling is becoming worldwide now. I mean, California is growing huge and so is the Tour Down Under, China is getting bigger. 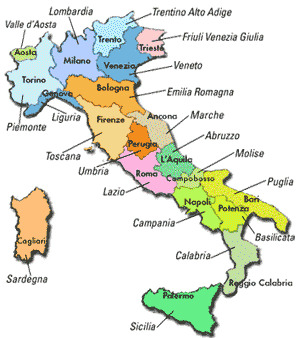 And on the other side, some of the big Italian races that I knew when I was younger are now being overshadowed. The traditions of the sport are counting for less and now on they have changed something crucial. So there is a big why. Is it just to make it harder? Is it just to make money? Is it because of politics and business? Or is it just to see more spectacular things in the race? These are the questions but I am not the organisers so I don’t know the answers." Tom Boonen, 2005 and 2006 winner: "To me it makes little difference where I win." The Belgian newspaper Het Niewsblad reported that Belgians are 3-1 against the changes. Fans have started a "we hate wouter vandenhaute" facebook page. 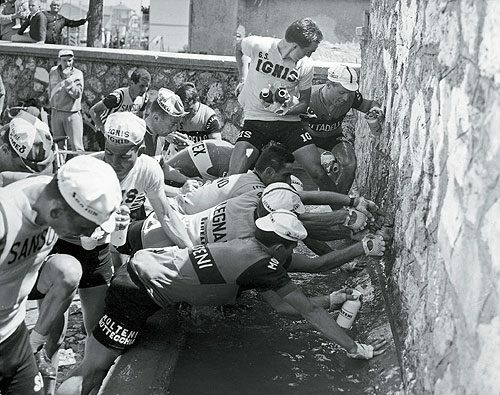 There is a also the "Keep The Muur And Bosberg" blog. WouterVandenhaute, the race director, has said that in order for the sport to progress, changes need to be made. He's made it clear that he wants to make cycling more attractive to sponsors — primarily to sponsors that will populate the expansive VIP tents he’s erected along the Ronde course. Vandenhaute believes it’s important to give sponsors something back, not just in terms of exposure, but also in terms of service, in terms of a “special experience.”"
Tomorrow: 257 km of pain and suffering on a new course should make for exciting watching . The 2012 Tour of Flanders will be held on Sunday. 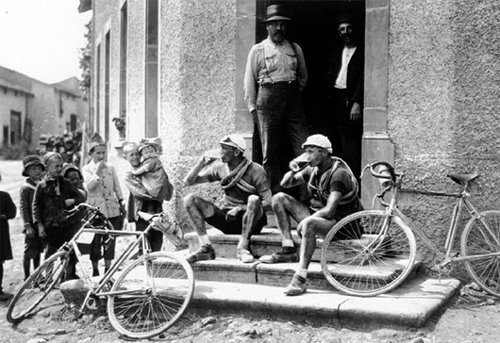 One of the five "monuments" of cycling, and the first of the Spring classics, it has been held since 1913. Belgian riders have had the most victories, 67, with Italians following with 10 victories (Netherlands 9, France 3, Germany 2, Switzerland 2, United Kingdom 1, Denmark 1). 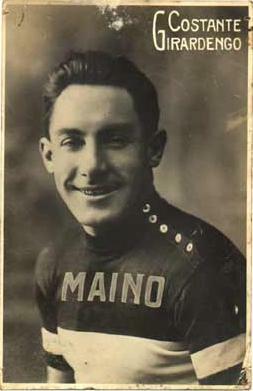 The first Italian victory came in 1949 with Fiorenzo Magni. Before WWII the race was usually held on the same day as Milan-Sanremo which kept Italians at home and the French riders preferred Milan-Sanremo as well. In fact, the there was only one non-Belgian victory before WWII (in 1923 by Heiri Suter of Switzerland). Gianluca Bortolami's victory in 2001 set the record for the fastest Tour of Flanders at an average speed of 43.6 km/h. Italian favorites for Sunday's race: Alessandro Ballan (winner in 2007) and Filippo Pozzato (6th in last month's Milan-Sanremo). 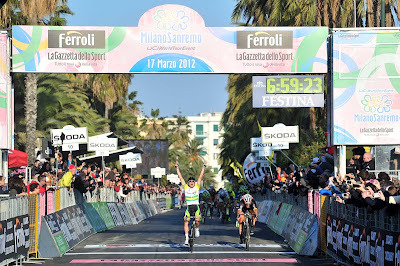 From a team perspective Liquigas has Peter Sagan who finished 4th in Milan-Sanremo. 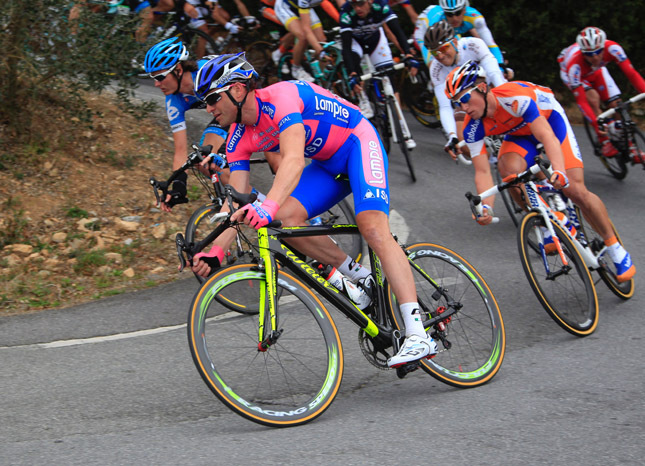 The captain for Lampre will be Danilo Hondo who finished 16th in 2011 and 9th in 2010 in the Tour of Flanders. The course has been changed drastically for this year's race. The finish was changed from Meerbeke to Oudenaarde; famous hills like the Muur van Geraardsbergen and the Bosberg that have been the final two hills in almost every edition since 1975 have been removed from the course. The new final features the Oude Kwaremont and Paterberg, both will be climbed three times. Also included in the final are the infamous Koppenberg (climbed after the first passage of the Oude Kwaremont and Paterberg), the Steenbeekdries and the Kluisberg. Danilo Hondo, after an 80 km recon yesterday said, "This year Ronde van Vlaanderen will be even more demanding than usual since the opponents are very strong and the new course is really tough." Coming Soon: Vol. II of "The Story of the Giro d'Italia"
You can also read more about Volume I in the blog entry "The Story of the Giro d'Italia": Preface and Excerpt". Another recent "detour" was Neuron Shifting and Robots, a story about using your brain to shift an electronic gruppo. Sparta Cycling is pleased to announce that the first annual Berkshire Cycling Classic in Lenox, Massachusetts on May 6, 2012 has been named the American stop on the fifteen event UCI WORLD CYCLING TOUR for 2012 through 2014. The rides are held as Gran Fondo (Cyclosportif) event formats. “Our Berkshire Cycling Classic offers a unique experience for cyclists, whether they want to have a ride with friends and family in Lenox and the Berkshire Mountains, or qualify for the UCI WORLD CYCLING TOUR final”, said Eustice. The UCI World Cycling Tour (UWCT) is a series of UCI-sanctioned Gran Fondo/Cyclosportif events that are held all over the globe. The top 25% in each age group of the qualifier events will automatically have the right to compete in the UWCT Final and race for the coveted UCI rainbow jersey. The Berkshire Cycling Classic will be the only UWCT event in the United States this year. Cycling Classic features route selections of 62 and 81 miles (100k and 130k). Overall times for both distances will be recorded and ranked according to age groups. Lenox, nestled in the heart of the beautiful Berkshire Mountains provides the perfect host venue for this challenging Gran Fondo/Cyclosportif. Registered riders in the UCI WORLD CYCLING TOUR sanctioned Berkshire Cycling Classic will receive technical support provided by Mavic USA, well-positioned “feed zones”, or rest stops, complete with energy food, choices for hydration, and areas to relax as they tackle the course. Pre-registered riders will receive a commemorative t-shirt and vendors will be on-hand to sell a limited edition jersey. Following the main event, riders and their families will be invited to a post-ride celebrations hosted by our many local partners (locations to be announced later this month). Marianne Vos (Stichting Rabo Women) won the Trofeo Alfredo Binda for third time yesterday by putting on a show of strength in the last few kilometers of the 131.2 km race. 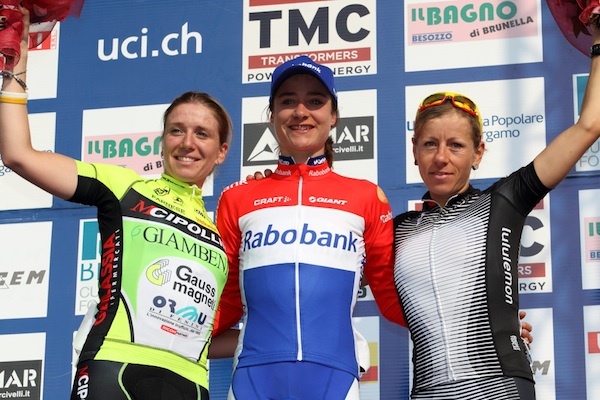 Vos left her opponents behind and arrived alone at the finish line with a 34-second advantage on a group of eight led by Tatiana Guderzo (MCipollini), while third place went to German rider Trixi Worrack (Team Specialized). Vos has strengthened her leadership in the World Cup, having now won the first two races (Ronde van Drenthe and Trofeo Alfredo Binda). "I am delighted with this win," said Voss. 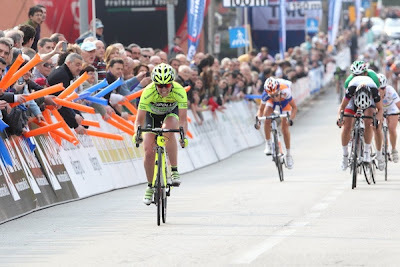 "I really couldn’t say which of my three victories in Cittiglio was the best. Today the group reformed following Loes Gunnewijk’s (Greenedge) break and then I took advantage of a moment of indecision to break away from them". Tatiana Guderzo, who has been recovering from stomach problems, was happy with second place, "I didn’t really feel good, then kilometer after kilometer I found the strength to keep going and end up being a protagonist at the finish line". This was the only women's World Cup race scheduled in Italy this year. Their next World Cup race is April 1st, Tour of Flanders. At the starting line, a minute’s silence was observed in memory of Michele Silvestri, an Italian soldier who was killed Saturday in Afghanistan. 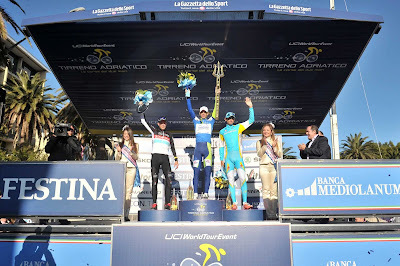 Mario Cipollini said in early March that, "I want to return to racing by coming to the Giro...... The following week, Cipollini said, "We’ve just come into contact with the UCI, and for them it’s also something quite new. At the moment there are email exchanges between my lawyer and their legal office to see what we have to do." 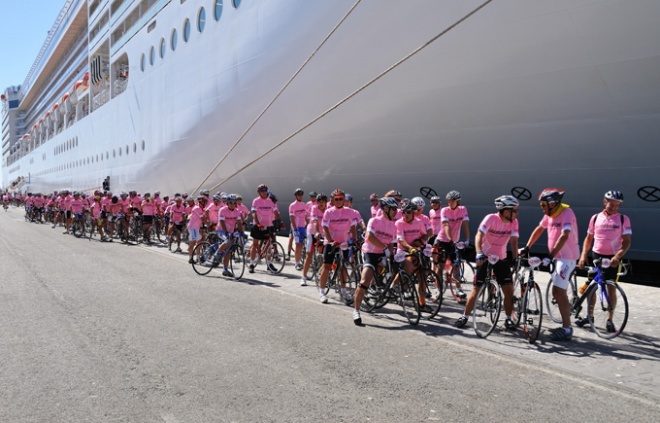 But there is a conflict: the Giro d'Italia begins May 5th in Denmark and the cruise lasts until May 6th. Mario Cipollini recently spent a day in Calmasino di Bardolino, by Lake Garda, with the MCipollini-Giambenini-Gauss women's team sharing his years of experience. Cipollini discussed subjects ranging from nutrition, massage, stretching, position on the bike, to doing an early morning cycling workout on the road and working on the construction of a train for the sprint. 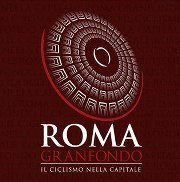 Granfondo racing is coming for the first time to Rome on October 14, 2012. 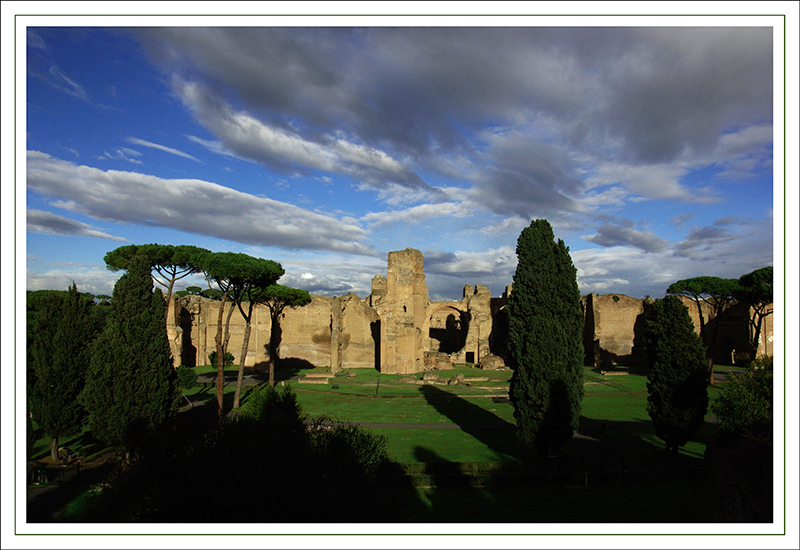 The route will take riders past the Coliseum, Via Dei Fori Imperiale, Piazza di Spagna, and the Castelli Romani area. A number of events (expo, test ride, etc.) are also being held. 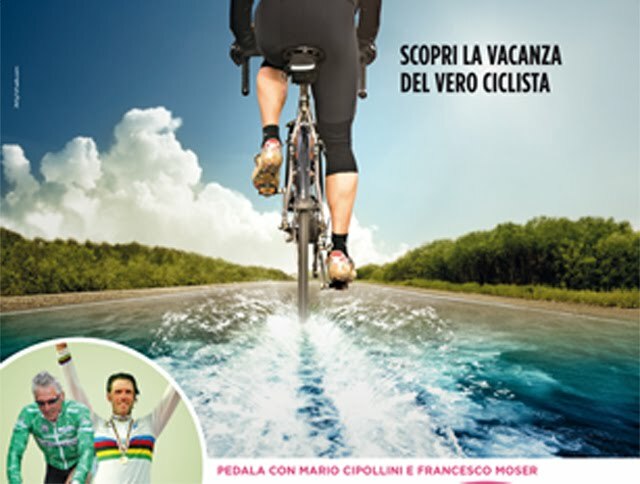 The big Italian magazine BICISPORT became available in a digital version in February. Now it has also become available in English in the digital version. 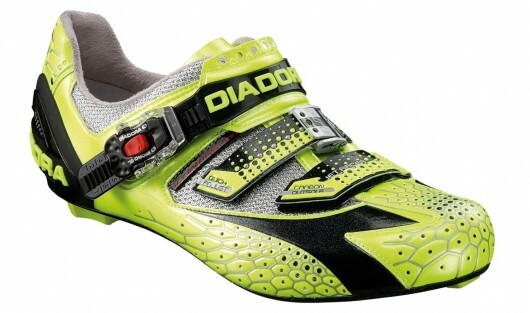 If you want the Italian slant on road cycling this would be a good choice. See here for subscription information. Just be prepared for a LONG wait before being able to read the magazine. I think it took 5 days after payment (via credit card) before the March issue showed up in the reader. It seems BiciSport are yet to grasp the pay/instant-download paradigm in use on the internet for the past decade. Also, a lot of the payment process is in Italian (including transaction receipt etc.) so if you don't speak the language be prepared for some head scratching as you try to figure out if something has gone wrong because you can't yet read the magazine :-)"
And, from reader Robbin, "I got my registration sorted out, payment was quick and easy and the on-line edition was available to me right away. Awesome magazine, over 200 pages of stories and photos in the March edition. 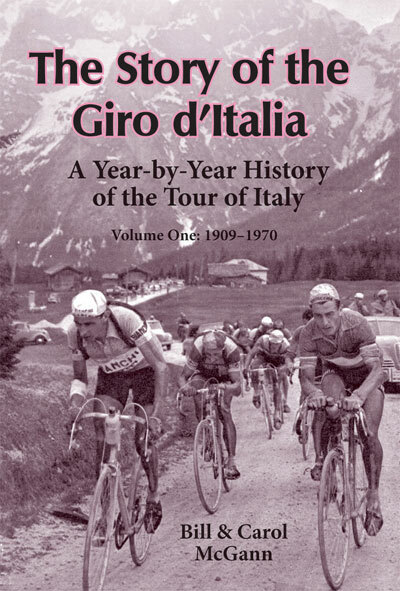 You can sense the Italian passion for cycling on every page, really cool. Thanks Angelo for letting your readers know about this new service." Alfa Romeo wool cycling jersey made from merino wool, available from www.soigneur.co.nz. 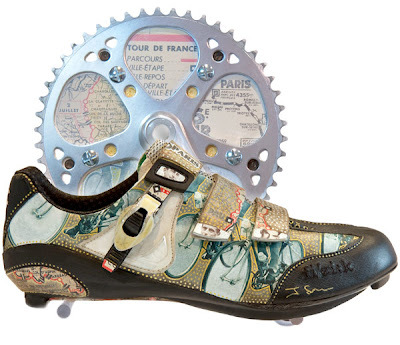 Read the Soigneur story here. 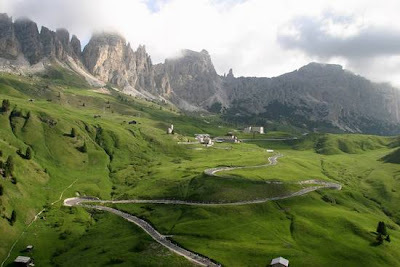 If you were not selected in the random drawing for the 2012 Maratona dles Dolomites you will have another chance to enter via 165 registrations at an increased price on March 22, 2012, starting at 6 p.m. (GMT+1) at www.maratona.it. There will be 150 GOLD registrations at a price of 200.00 euro and 15 PLATINUM registrations at a price of 400.00 euro, purchased by credit card only online. The registration fee of 83 euro is included, the difference will be given to charitable organizations (further information: http://www.maratona.it/info/charity-2012/en). With the purchase of a charity registration you will get a small souvenir of the event in addition to a preferential starting grid, Platinum registrations in the first starting grid and Gold registrations in the second grid. The Maratona is on July 1, 2012. 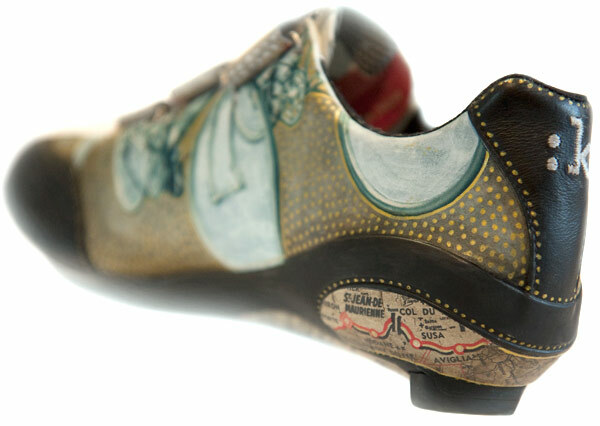 Selle Italia has launched an all new website at www.selleitalia.com. "Our new website has the same URL with a lot of great features", explained Ingrid Bordignon, Selle Italia Marketing & Communication Manager. "We have incorporated social media, with YouTube, Facebook and Twitter playing a key role in the restyling and renewal of our site." In addition to social media, Selle Italia's new website has all the new product news and product information on Selle Italia. "We have included an extensive array of product information on the new website as well as tutorial videos on assembling and fitting our new Selle Italia products." www.selleitalia.com is available for all new devices, so smartphone and tablet users can easily interface with the site. The new dealer locator feature using Google Map’s offers precise information on how to find a Selle Italia dealer anywhere worldwide. Liquigas-Cannondale's Agnoli pulled away on the Le Manie, 97 km from the finish, with Nibali in tow, a move that put Cavendish into trouble and from which he was never able to recover. A dream unfullfilled: that of joining Binda, Merckx and Saronni as the only riders to have won MSR as world champion. Cavendish didn't say anything to the press after the race but his teammate Bernhard Eisel was blunt, "Mark just didn't have it today, it's as simple as that. He was going well in Tirreno but seemed to be lacking some horsepower out there today. It's a shame because he really wanted to win this and he's disappointed, for sure." The race for Alessandro Pettachi ended on the approach to Capi when he lost the wheels of the peloton and eventually withdrew. 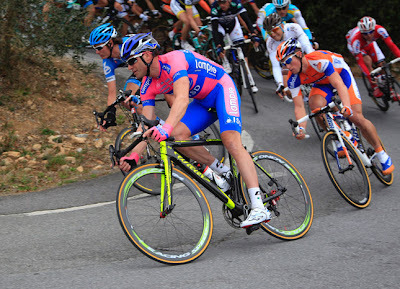 Petacchi had started at not 100% after having pulled out of the Tirreno-Adriatico. Philippe Gilbert, looking very well, crashed at 22 km to go and although he restarted quickly any chance for a victory was over. "It was Dominique Rollin from FDJ who was maybe on the limit and taking a lot of risks," Gilbert said. "He made a lot of riders fall around me. I was afraid because there were cars passing on my right. I slid on my back and then other riders crashed into me from behind." Tom Boonen was a few seconds behind Cancellara, Gerrans and Nibali on the descent of the Poggio when he was caught behind a crash. 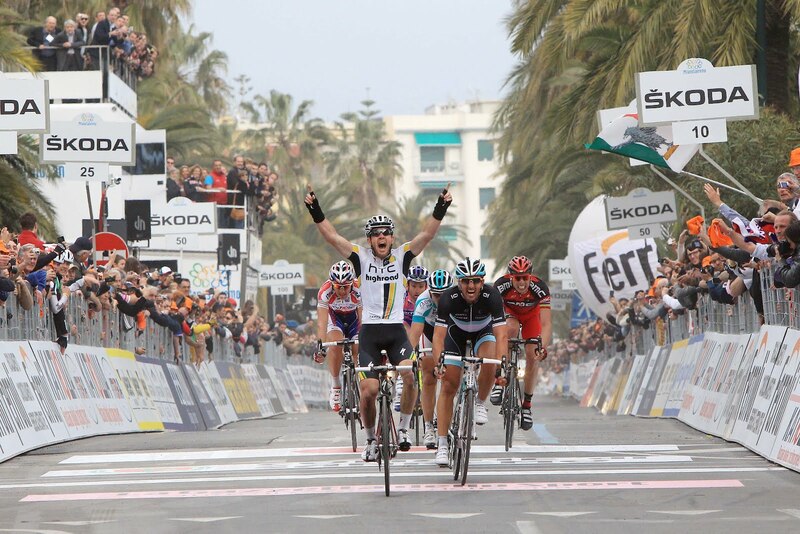 "I had really good legs, maybe the best legs ever in Milano-San Remo," Boonen said. "It was always under control and the team did a really good job for me. They kept me in the first 10 to 15 positions in all important moments of the race. Then on the Poggio I was 7th or 8th when we took the corner to go downhill. I was really good, the team was with me, and we were in good position ready to fight for victory. Then, in the first part of the downhill a rider crashed, and I was just behind him. I had to brake, and lost 100 meters. Because of that it was impossible to come back." Matthew Goss tired on the Cipressa and the Poggio where he found himself at the back of the lead group from which Gerrans and Cancellara went after Nibali's attack. Six more one-day classics now follow over March and April in Belgium, France and the Netherlands. 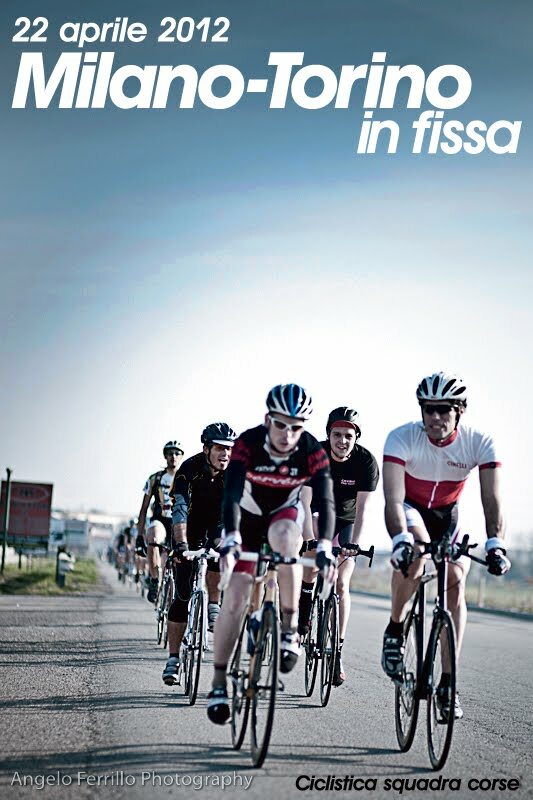 Then the Giro d'Italia begins on May 5th in Herning, Denmark. 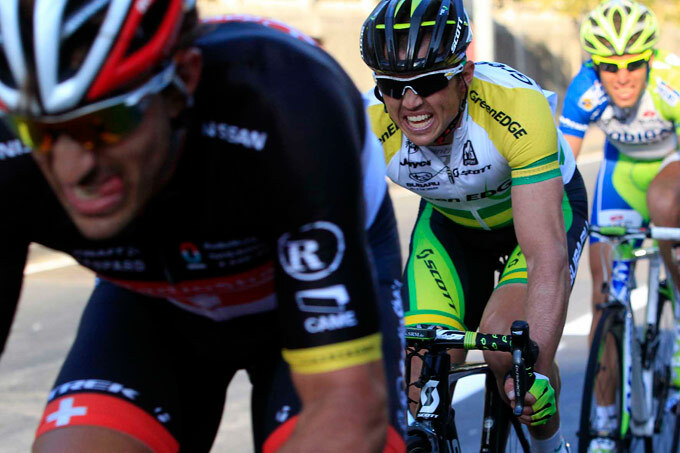 Australian national champion Simon Gerrans (GreenEdge Cycling Team) has won the 103rd edition of Milan-Sanremo. Gerrans, Fabian Cancellara and Vincenzo Nibali attacked and escaped the remnants of the peloton on the ascent of the Poggio and Cancellara led all the way on the descent and up to the last meters when Gerrans came around. 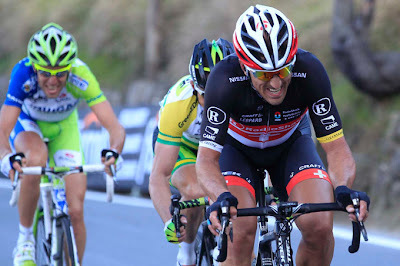 Fabian Cancellara (RadioShack Nissan Trek) finished 2nd, Vincenzo Nibali (Liquigas Cannondale) finished 3rd. "When Cancellara pulled so hard I knew there was a good chance of reaching the finish line," said Gerrans. "I rode with great coolness and I waited until the last few meters to play my card. I gave what I could to help the escape succeed but knowing that Fabian is so strong I kept a reserve of energy for the sprint. I didn't speak with Goss much during the race but the plan was that I would go on an escape and if it failed Goss would be there for the sprint." "Milan-San Remo is becoming a very fortunate race for us Australians, last year Goss won now I've won. I do not think there was a better way to win a big race like this, with the Australian team being supported by a great project, and wearing the Australian champion's jersey on my shoulders. I think it's the best I could ask." The 298 km were raced in 6h 59’ 24” at average speed of 42,632 km/h. Gerran's win stretches the victories of foreigners over Italians to 53 vs. 50. 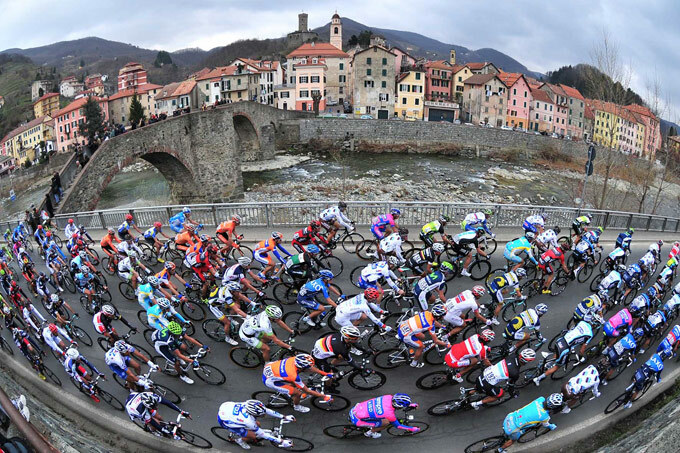 The 103rd edition of Milan-Sanremo begins tomorrow at 0945 (Italy time) at Piazza Castello in Milano. 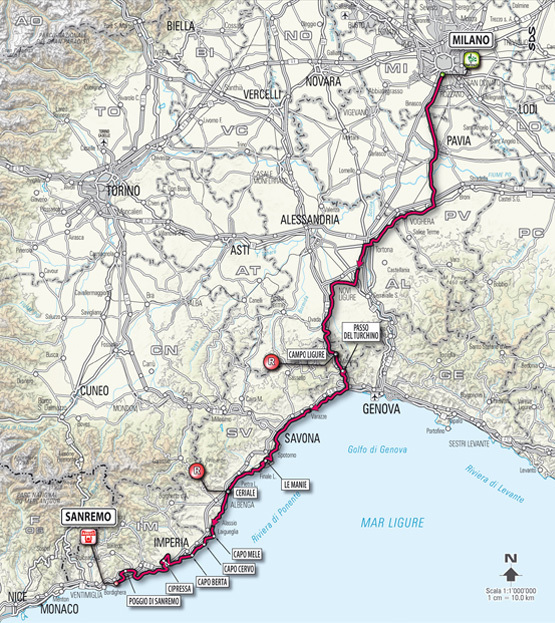 The finish after 298 km, on Lungomare Italo Calvino, in Sanremo is expected between 1700 and 1730. 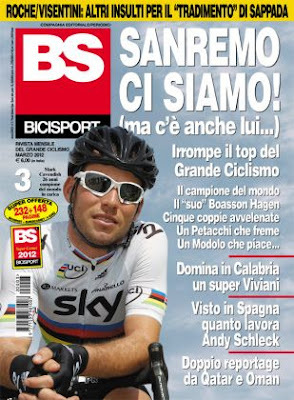 Favorites: Australian Goss, winner of the last edition (above), World Champion Cavendish, Spaniard Freire (attempting to win his 4th MSR), Belgium's Boonen, the American Farrar, the German Greipel; Slovak Sagan; the now-Australian Haussler and Italians Petacchi and Modolo. Hopefuls for launching an attack on the Cipressa or Poggio in order to not to contest a sprint finish would be Gilbert, Cancellara, Nibali, Italian national champion Visconti, Pozzato, Cunego, Garzelli and Nocentini. Italy's RAI will televise the race live on RAI Sport 2 beginning at 1430 and also on RAI Tre beginning at 1450. The race will also be broadcast via interent streaming 1450 at www.gazzetta.it. You can also check English language websites www.cyclingfans.com and www.steephill.tv for feeds that they each pick up in various languages and stream. Most victories by an Italian: 6 by Costante Girardengo, 1918, 1921, 1923, 1925, 1926, 1928; Bartali and Coppi had three victories each. 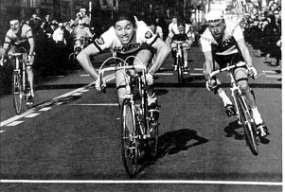 Most victories by a foreign rider: 7 by Eddy Merckx (Belgium), 1966, 1967, 1969, 1971, 1972, 1975, 1976 (photo: Merckx winning his first MSR). Milan, March 15, 2012 - The Belgian champion Eddy Merckx is the first rider to be inducted into the newly formed Giro d'Italia "Hall of Fame". The inauguration was held this afternoon at the Sala Montanelli in via Solferino in Milano. The Hall of Fame of the Giro d'Italia is a "first" in international cycling, designed to give tribute to the great champions who have entered into the history of the Corsa Rosa. Eddy Merckx, the "Cannibal", was presented with the Trofeo Senza Fine (Trophy Without End) for 1974 which is when Merckx won his last of five 5 Giros. 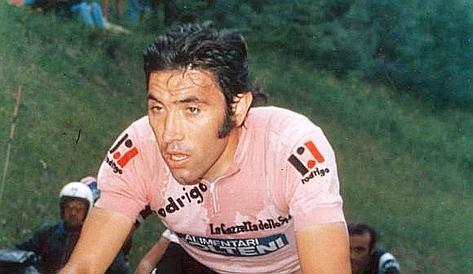 Eddy Merckx won his first Giro at 22 years of age, in 1973 he was the pink jersey from start to finish, wore the Maglia Rosa for a total of 78 days, and he won 25 stages in total. 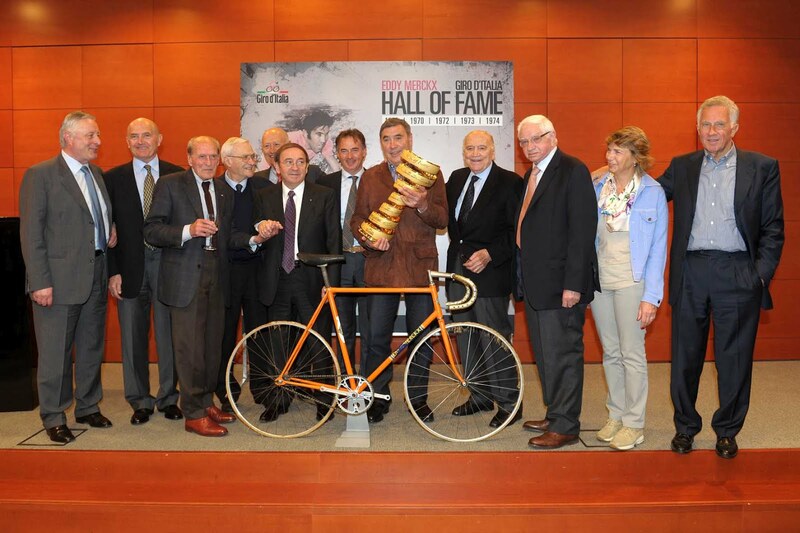 Attending the induction ceremony were some of the Italian cycling greats and some that shared Merckx's exploits: Alfredo Martini, Fiorenzo Magni, Ernesto Colnago, Gianni Motta, Italo Zilioli, Giorgio Albani, Marino Vigna, David Boifava, Ugo De Rosa and Mario Molteni (son of the famous sponsor of Merckx). "To be the first to enter into this Hall of Fame is a great honor for me. 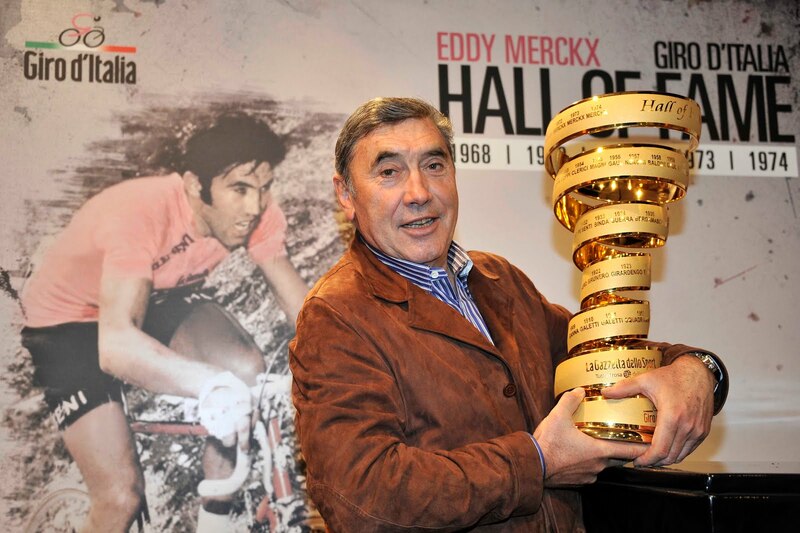 Italy is my second home, here I feel as loved as I do at home in Belgium,"said Merckx. "The victory on the Tre cime di Lavaredo of the 1968 Giro was undoubtedly the day where I was strongest in the mountains in all of my career." "Italian cycling is very important for me: I learned a lot from Adorni, my friendship with Magni took me to Italy, then I met Colnago, then De Rosa taught me how to make bicycles, with Motta I had some good battles, and my friend always....Zilioli." 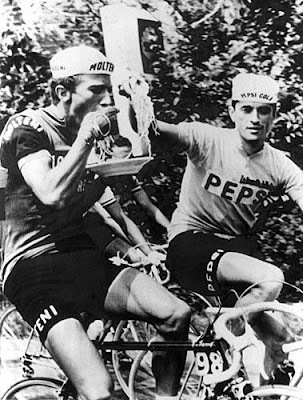 The first Italian race in which Merckx took part was the 1966 Milan-Sanremo which he won. For Saturday's Milan-Sanremo Merckx obeserved, "There are so many riders in good form: Nibali, Cancellara, and Freire who could win his fourth. If Cavendish doesn't get dropped on the the Poggio I think it's really hard to beat him. Among the Belgians, I think that Boonen is the best bet, I think Gilbert is not going so well. 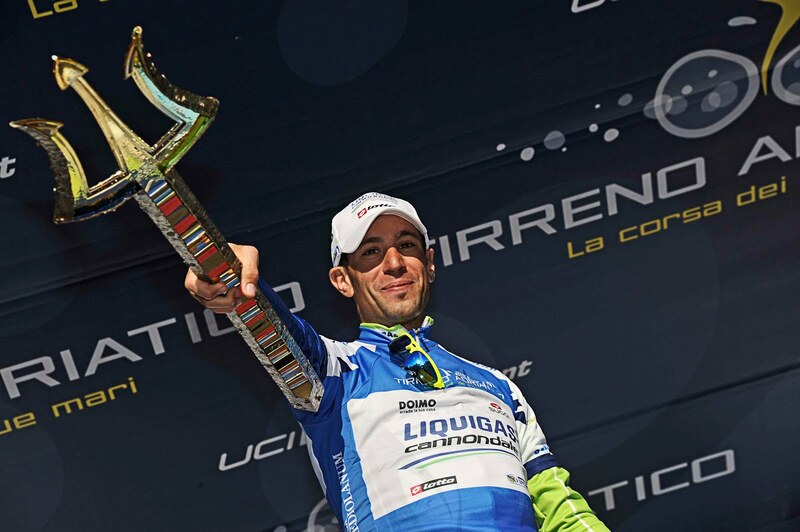 Nibali has great qualities, however, he must learn to ride more with his head. If he's riding well I think can make a difference on the Poggio." 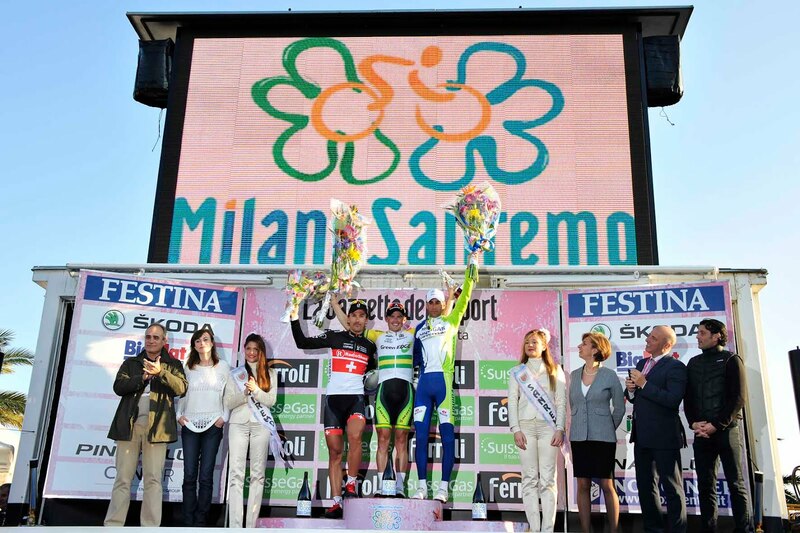 Several events are planned for today and tomorrow leading up to Milan-Sanremo on Saturday. 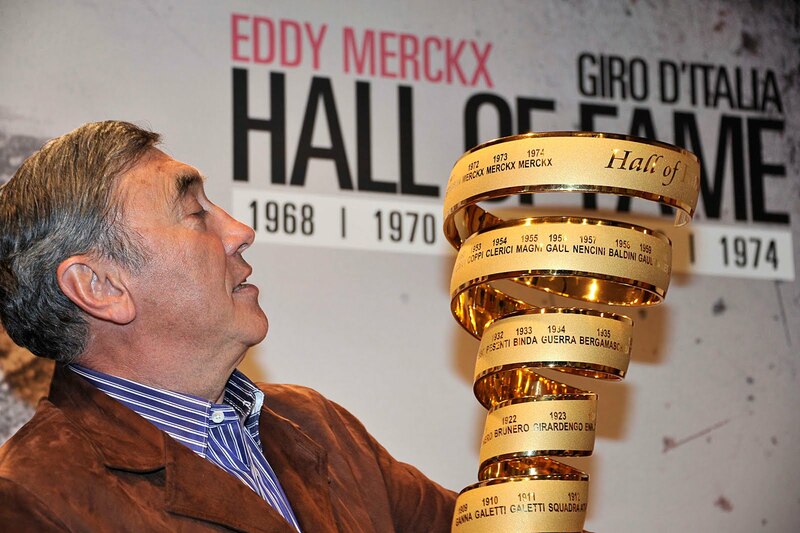 Of these the most interesting is the induction today of Eddy Merckx into the new Giro d'Italia "Hall of Fame". 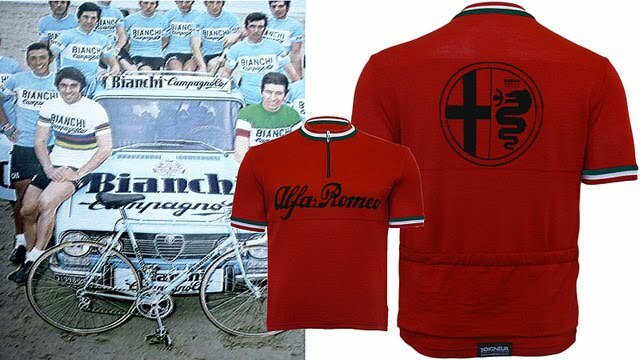 Attending will be Alfredo Martini, Fiorenzo Magni, Felice Gimondi, Ernesto Colnago, Gianni Motta, Vittorio Adorni, Italo Zilioli, Giorgio Albani, Davide Boifava, Ugo De Rosa and Mario Molteni (son of the famous sponsor of Merckx). Finish: estimated 1700-1730 on Lungomare Italo Calvino, Sanremo. Vicenzo Nibali (Liquigas Cannondale) is the winner of the 2012 Tirreno-Adriatico. He was able to recover the 6 second deficit he had at the start of the TT stage to Chris Horner to win by 14 seconds over Horner. Nibali's effort was very impressive: he finished the 9.3 km stage in 10:56 for ninth place; one second faster than than TT specialist and Italian national TT champion Marco Pinotti. 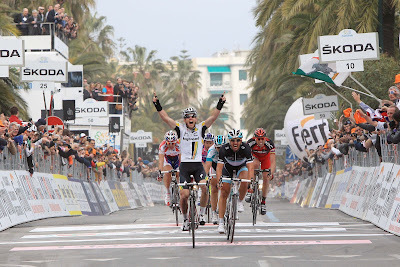 The winner of the stage was Fabian Cancellara (Radioshack Nissan Trek), above. Vincenzo Nibali: "I arrived at this Tirreno with more races under my belt than anyone, between Argentina and Oman. Then at home I did the right kind of training and worked very hard. And here the team was perfect. Sagan and I together can be very successful. Liquigas can now pose a double threat and by playing our cards right we can frighten everyone. 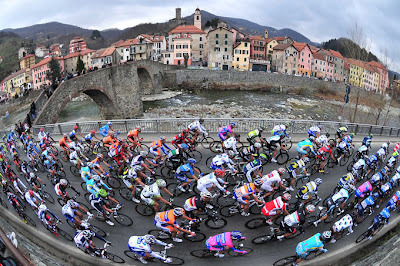 The Tirreno was one of the objectives for the start of the season and the next are Milan-Sanremo and the races in the Ardennes. We are in good shape, but obviously we are going to have to work hard to maintain this level of fitness. I want to prepare my best for the most classic of races on Saturday. I know that to win it I am going to have to invent something, but I really enjoy a challenge." Chris Horner, who almost became the first American to win Tirreno-Adriatico: "I have no mixed feelings about this. It’s been a fantastic week. 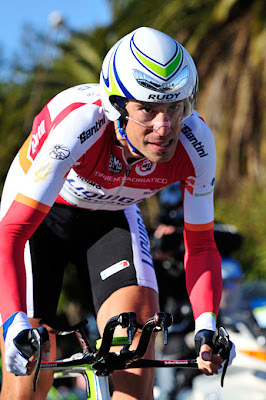 The team did a great TTT to set me up to take the jersey and I defended it for a few days. Tactically I think we did a brilliant race. This is not a course that is ideal for me, but to stay on the podium is good for me. I was concerned that I might not stay in the top three. The only feeling I have about this is one of feeling great – great about the way the team worked this week and great about the way my legs feel." 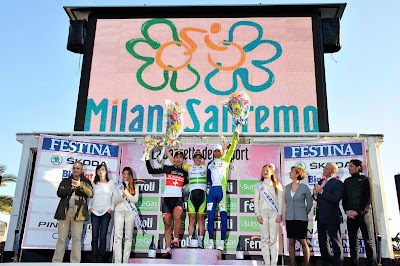 Next up: Milan-Sanremo, this Saturday, March 17, 2012. 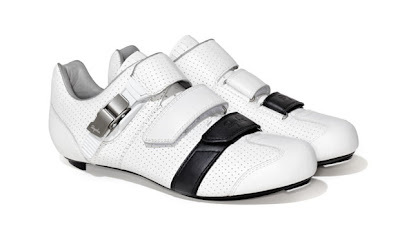 THE COMMENTATOR revisits "A Sunday in Hell"
Colnago C59 Disc, Disc Brakes the Next Wave? Will the Lion King Roar Back?